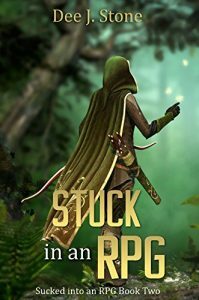 Jamie and Evie are still stuck in an RPG called Duriell. After being unsuccessful in getting out of the human world of Pardem, they’re off on their next adventure—Andrina, home of the elves. There are lots of new places to explore, monsters to kill, and items to loot. With each quest they complete, they hope they’re one step closer to finding their way home. Things start to look up when they meet an NPC who might have the answers they’re searching for. But is this the information they need or are they being sent on a wild goose chase? And when one of their lives is in danger, they wonder if there is any hope of ever getting back to Earth.